different for Halloween he always comes back to his roots. This year is no exception! 2007 Cowgirl, her dog, indian princess, righthand man on his trusty steed. 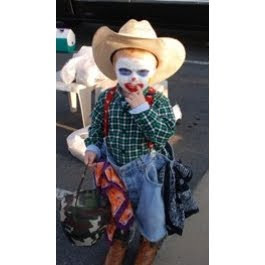 A rodeo clown was he for 2 years in a row because mom I'm not a clown or a bullrider I'm a roper. Some other things we have in our cap are John Wayne, Man from Snowy River, and my favorite idea if they can make it work are Team Roping Partners, One is the Header, one as the Heeler. I told them they had to be creative and they could do it next year. 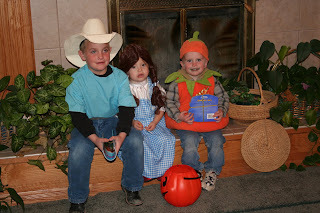 Rodeo moms we have an obligation and duty to keep our heritage strong even on Halloween. Be creative and have fun! Love the life we live and don't try to be different because it is Halloween, Celebrate your Cowboy Heritage because, it's Halloween. From one rodeo mom to another.